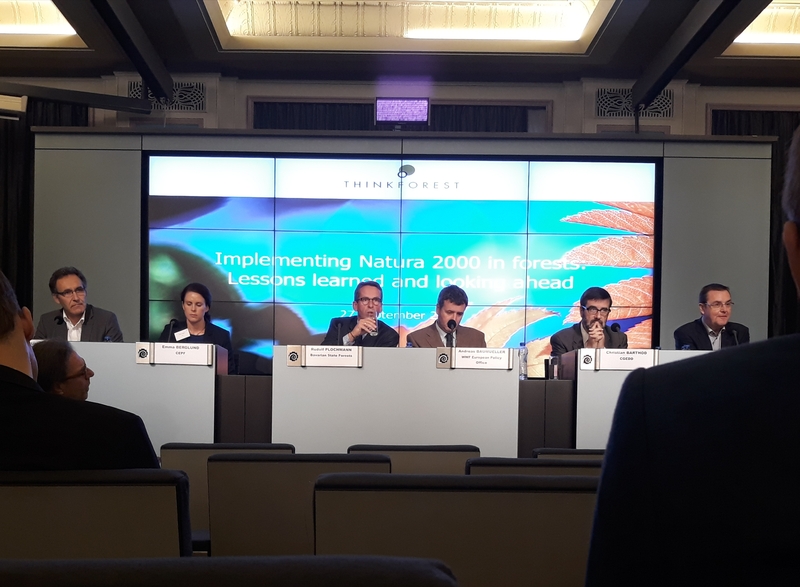 On 27 September, the European Forest Institute (EFI) organized a Think Forest seminar in Brussels – focused on Natura 2000 in forests. EFI’s new report, which was launched at the event, summarized both conclusions from the work accomplished so far and further opportunities to look ahead to. The participants agreed that the Natura 2000 network could have a favorable effect on biodiversity as long as they are sufficiently implemented. However, the experiences from the last 25 years have shown that the implementation could be improved. The participants in the seminar came from the forestry sector, NGOs, universities and national authorities as well as from the European Parliament and the Commission (DG ENVI). In the discussion, all participants agreed that the involvement of both Member State authorities and all relevant stakeholders is essential in order to achieve satisfactory implementation results on the ground. The involvement of stakeholders has often been insufficient, which was stated several times, also by EUSTAFOR in its position paper on the Fitness Check of the Nature Directives. Marku Lamp, the Estonian Deputy Secretary General of the Ministry of the Environment, said that his country had managed to build up a well-designed network of protected forests which would now serve as a basis for planning beyond 2020. Humberto Delgado Rosa (DG ENVI) underlined the importance of having a constructive dialogue, especially with landowners and the Member States and pointed out the exceptional position of state forest managers to articulate their role in nature conservation and Natura 2000 implementation. Rudold Plochmann (Bavarian State Forests BaySF) shared state forestry experiences and underlined that a system that integrates nature conservation into sustainable forest management was the solution to achieve positive results. Other speakers from the panel and from the audience underlined that one of the biggest problems with implementation of the nature directives is that the cost largely resides with landowners, forest managers and farmers, whereas the benefits for society does not generate much monetary compensation for these groups. In principle, everyone present was united in the belief that to bridge this ‘gap’ in funding is essential to the long-term success of the Nature Directives. As funding is limited, and very little is specifically dedicated to Natura 2000, it means that the risk of opposing interests will likely continue to be present in the future. However, a more consistent view of the challenges from all stakeholders and authorities involved is a good start. The event was broadcasted live and is still available on YouTube.